Fecundity is the word of the month here: grass and weeds waist high if we so much as turn our backs, lettuce’s the size of a very big thing and various babies all over the place. The little fella at the top is a Berkshire piglet, one of a litter we went to see the other day. They’ll be weaned at eight weeks, when we’ll be bringing two castrated boys home to install in the paddock at the top of the field, where they'll run around under the summer sun eating grass, plums, cherries, apples and finally acorns (along with some cereals). We happened to turn up at Jan’s at the same time as her vet, who’d come to castrate the boys. Gabrielle went for a little walk. On a recent English TV programme about the way pigs are raised, there was mention made of the apparent lack of necessity of castration as they go for slaughter before it really gets to matter and the fact that they are castrated without anaesthetic. Having now seen the vet do it, I reckon it’s the right thing to do. We’ve seen ourselves that too much testosterone isn’t especially helpful on our permaculture smallholding so, unless you want a male to breed from, it’s best for everyone if one’s males are separated from their testicles. The young French vet, Florent, who spoke impeccable English with a German accent (his mother is German) explained that it was the speed that mattered. He tucked a piglet, head down between his legs, pushed a testicle in position with his thumb and made a horizontal cut in the scrotum with a scalpel, popped out the testicle, then pressing hard with his thumb to hold the tubes in place, he pulled and the testicle came away. Same again for the other side, then a good coating of antiseptic/antibiotic powder and the piglet was put back in the pen with his mother. Most of the piglets made not a squeal and they were all sleeping soundly within about ten minutes. Jan tells us that they heal very quickly and after a couple of days, you can't see any sign of this intervention. We have six chicks by four hens at the moment, with another two hens broody, leaving just one hen actually laying eggs and a housing problem as I try to accommodate all their different needs, whilst leaving the nesting box free for our lone egg layer’s daily visit. So far, in three years living here, we don’t have a problem with foxes, nor rats, so they free-range during the day, which is a delight to see: the various mum’s showing their offspring how to scratch about, what to eat, and get into fiercely protective mode if I come too near. 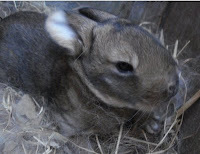 Bunny Lapine, our enormous rabbit has had her third litter. Eight the first time, no less than eleven last year and then … one. The received wisdom in the village is that she is “trop graisse (too fat) that we’ve overfed her. Nevertheless, it’s good news for her sole kit, as s/he has all the mother’s milk to itself and—I’m not exaggerating—gets noticeably bigger as each day passes. We’ve been told to put the rabbit to the buck again very soon, after several sessions of WeightWatchers, perhaps. Our edible plants (Gabrielle’s department) are growing well but then so is the grass and weeds. It’s like some chlorophyllic version of Grandmother’s Footsteps: I turn my back, then when I look behind me again, everything’s grown by six inches. Still occupied with barn re-roofing and a host of other priorities in the “List of Things to Do”, it’s quite a problem, as if the grass gets too tall, I have to scythe it before I can run the mower over it. That’s already happened in the pig paddock, so I’m slowly working my way across with my scythe (scraping up the cut grass and creating a huge pile, mixed with straw, to turn into compost) then passing the mower and trying to knock it back into shape before our piglets arrive. Something else that’s drifted off the radar recently, is our woodland. I pencilled in a day for the woods last week, planning to take a good look at what was going on, then maybe carry on collecting logs I’d cut over winter, piling them up for collection by (borrowed) tractor and trailer. I arrived to waist-high nettles and brambles. The ride that I’d cut last year had created a gap in the canopy, allowing nourishing sunlight through and so helping these weeds to thrive. 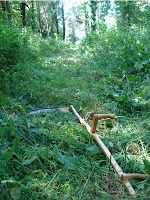 I set about them with my razor-sharp Austrian scythe and had, in a satisfyingly short amount of time, cut a walkway right to the back of the wood. Physically tough, there are however lots of benefits to using a scythe, in comparison with a petrol-driven strimmer. When correctly sharpened and used correctly, it’s very efficient and I wouldn’t mind challenging someone with a strimmer to a “race”. Along with the workout, I also find it meditative, as one has to concentrate on each swing and you also get to hear the birdsong while you work. 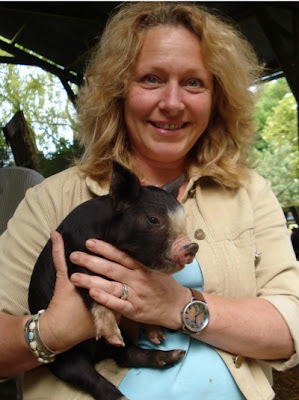 Castrating pigs is very easy, as you noted and yes, they heal remarkably quick. When I raised wild hogs, I would try to castrate them as soon as possible, the sooner you do it the easier it is. One thing though, most of the time they make as much noise as a jet's engine, so we wore hearing protection! A 4" wide by 12" long piece of PVC tube split down the middle makes a great cradle to hold the piglets while castrating them. Just came across your blog. Love it. My wife and I recently spent 8 days in France and loved it. The Jardins Familiaux caught my attention. Lots of people there who would appreciate what you have to say. Over 1200 food gardeners and locavores and permaculturists networking together.